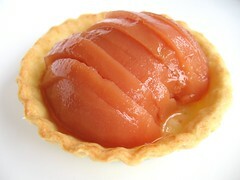 Quince Tartlets - Do You Know The Muffin Man? Notes: I made 2/3rds of the syrup and only poached two quinces. This recipe uses the peels and cores in the poaching liquid; I think this adds more pectin so that it will gel. I oven roasted the fruit for the full 2 ½ hours. The poaching liquid turned a nice pink-orange after I reduced it, but the fruit was a duller colour, not as vibrant as the magazine photo. Working with the crust was very easy, although I rolled it thinner than 1/8 of an inch making it fragile, but it was no problem to patch it. The finished tarts are delicious: the crust is tender, like a shortbread and roasting the quince really brings out their apple-guava flavour.